but in other ways, things are humming along. One thing on my mind is the ferry dredging progress. Up front, this is my version of the events and I am not a professional concerning water issues. Hence, I have hesitated to step into this area but since this sort of transportation is essential for the Island, here goes. It has been at a steady/urgent pace over the past several weeks with what seems - to me - just two days off at Christmas. The crew from Roen Salvage are here working with their barge. An excavator and dump trucks from Mike Kahr's Death's Door Marine arrived the day after Christmas. Mike arrived last week fresh off another job on the water at Fish Creek. Okay...I just had to include this photo...I hope Mike doesn't mind...it was a Kodak moment for me. Dump trucks carry the clay,stone, sand, muck, etc. from the barge at the Potato Dock to Julian Hagens's gravel pit. A hearty, conscientious group of Islanders drive those trucks. As I recall, since New Year's, two shifts from Roen have been in place. Hauling starts around 6:30 am carrying the softer material from the night digging and continues through the day into the evening with matter from the "hardpan" portion. As an example weather-wise, this afternoon it was sunny with the winds at 24 mph with gusts of 33mph - and the crew was out there at work. I am impressed to see how many different people, groups, entities have come together to make this project possible. This spirit of teamwork is evident in other places on this Island as well. It is one reason why I have chosen to be here. I could see skim ice in Detroit Harbor as we arrived on the afternoon ferry last Thursday so time is of the essence. We were on the Washington. The weather will dictate how long the Washington and the Eyrabakki can operate. 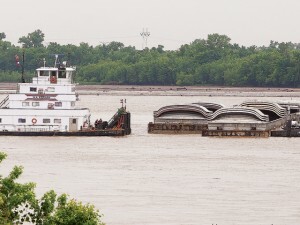 They have a shallower draft, the portion of each vessel that is submerged, so the lower water levels are not as much of a challenge for these two ferries. The "regular dock" can be used - for now. I have heard the Roen crews are hoping to work til/ finish on the 8th. A couple of other interesting facts......The rates will not change in 2013. The Board of Directors for the WIFL voted to maintain the current rates at the November meeting. Given the impending use of the Arni J. Richter as the ice sets in, I thought I would have to come to grips with the return of side loading. I remember when this was the custom on the former ice breaking ferry, C. G. Richter. But today I found the excavation will allow the Arni J. Richter to load as it does at the "regular dock". It looks like the amount of digging completed will allow truck traffic as well. Ticketing? Ticketing will be on a portable tablet-like system. According to what I see on the NOAA website, the weather could be above freezing for most of this week and once the temperature drops it will take some time for the harbor to ice over. I hasten to add there is a learning curve here. It will be a new process or challenge for all of us. Glad to see there is some time to continue to work on everything. Last year, the harbor was frozen over /ice breaker was needed about six weeks Speaking for myself, I am thankful for the efforts I have observed. My thanks to Hoyt Purinton for allowing me to take some photos. This is going to be an interesting Winter, but then the Winter is always interesting on the Island...Over the holiday, I found I couldn't get away from low water levels. I come from a town in Southern Illinois located on the Mississippi River. St. Louis was a stop for us this Christmas and the water was in the news there, too. It is day to day as to when commercial traffic on the Mississippi could cease given the troubled section south of St. Louis to Cairo. The photo above (from Reuters) shows crews clearing river-bottom rocks as well as what they call rock pinnacles as the water recedes near Thebes, Il, 150 miles south of St.Louis. Water from at least two lakes nearby has been released into the river but it may not be enough. The other negative is the forming of ice in the same area. It's known as "ice bite" - ice taking a bite out of the flow of the river toward the Gulf. *At Alton, I have watched the flow of the Mississippi...the highs...the lows...sometimes harsh...but it has always been steady so this is interesting, too. Maybe living alongside water has helped me to understand, accept, respect life on the water here as well. Not sure how I would cope in a land-locked area! **Here's another team effort on the Island ...actually this is just a portion of this team...The Island Players team that is. 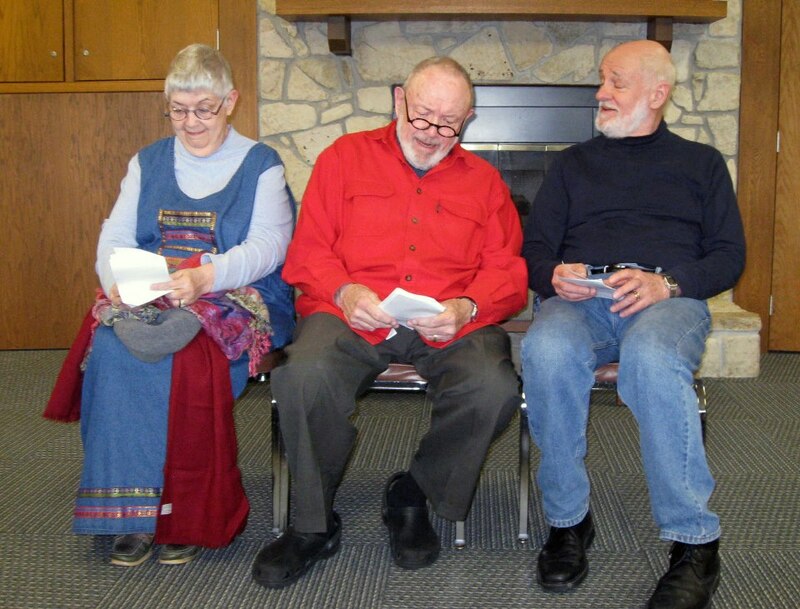 The group hosted their first "Center Stage," an afternoon of humor through staged readings on Sunday. Held at the Rec. Center at 2:00, monthly performances will be held on the first Sunday of the month through May. Complimentary refreshments are available at intermission and members of the audience are invited to try their hand in a reading during the second half of the program. Lastly, this is a team that needs no introduction yet is an integral part of Island Life. 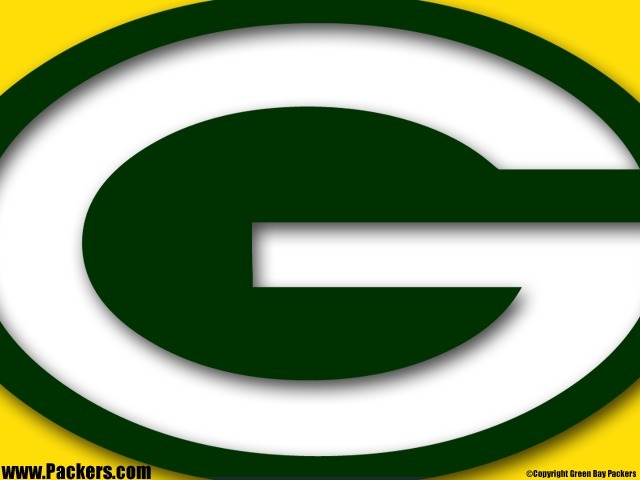 Next Saturday - the 12th - The Packers meet the 49ers in San Fransisco @ 7pm. Go Pack!